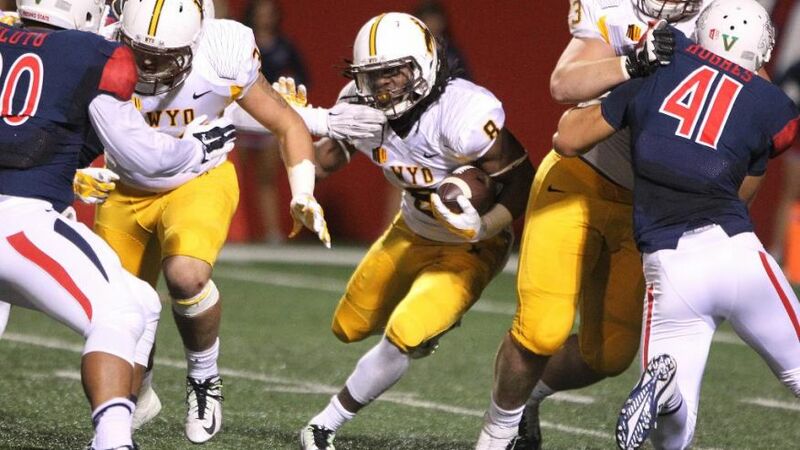 As expected, Wyoming was back to their losing ways last week @ Boise. The Pokes fell to the Broncos 34-14. This week Wyoming (1-7 1-3) will travel to Logan, UT on Friday to take on the Aggies of Utah State (4-3 3-1) for a rare Friday night match up. Wyoming was an underdog last week again covered. They are now 5-3 ATS, having reeled off 3 straight covers. This week the Cowboys were a 24-point underdog when the email was sent out, but are now a 28-point underdog. Thoughts on last week’s game? Tough start for the defense as Boise State scored on its first four offensive possessions. The offense never got anything going with a season-low 233 yards of total offense. Losing quarterback Cameron Coffman in the third quarter was a big blow. But even with Coffman, the Cowboys struggled against a top 20 defense nationally. Redshirt freshman Nick Smith will get his first-career start. Coffman is listed as doubtful for this game. It isn’t all on Smith to win the game, but he has to be smart with the ball and the coaches must try to put him in the best situations to succeed when throwing the ball. Utah State has forced 18 turnovers over the last five games. Wyoming can’t turn the ball over, and it starts with Smith. It doesn’t turn the ball over, can create some turnovers and gets off to a better start defensively. It also needs to find other offensive weapons besides running back Brian Hill and wide receiver Jake Maulhardt. Receiver Tanner Gentry also won’t play with a shoulder injury. Despite the loss, I thought Wyoming showed some progress, particularly on defense. That’s three straight weeks of defensive improvement, which is a good sign. The offense looked somewhat lost without Tanner Gentry. And then obviously losing Cameron Coffman hurts. Nick Smith. He was abysmal against Eastern Michigan in the passing game, but looked much better last week. How will he respond to his first career start? Wyoming wins if it wins the turnover battle by a nice margin. There’s really no other way to win without Coffman and Gentry. Need to forced turnovers. That game went about as expected. Once again the Cowboys covered the spread (moral victory, I guess), but that was probably one of the Pokes’ better performances in Boise in quite a while. The Pokes offense never really got on track and having Cam Coffman go down was a serious deal breaker. The Cowboys offense became VERY one dimensional once Nick Smith entered the game. Brian Hill failed to reach 100 yards rushing in this game. The Boise State defense kept the Pokes locked down for the most part. Boise doesn’t look like the team they were in past seasons, but Joe McNichols sure put on a show. Brett Rypien looks like he might be the real deal too, the true freshman has a good pedigree. Going to have to be Brian Hill if the Pokes are going to win this game. I’m not confident that Nick Smith can lead an effective enough passing attack for the Cowboys to be competitive in this game. Especially with Tanner Gentry still sidelined. Maybe over the course of the last week the coaching staff came up with some bananas offense that will surprise Utah State that will be effective, but I doubt it. I don’t know if there’s a scenario where I see the Pokes winning. No Cam Coffman, no Tanner Gentry, no threat of a passing attack against a top 25 defense. The Cowboys would have to play lights out on defense if they’re going to win this game. I just don’t think that’s in the cards right now. Wyoming did fairly well considering the circumstances. Coffman was hurt mid game and Wyoming historically has done poor versus Boise State both home and away but especially away. The coaching staff says the defense is making strides but I don’t see it. Much improvement needs to be made in these final few games. A WR not named Gentry or Maulhardt needs to step up. This will open up the middle of the field (with that WR probably coming out of the slot) and make the running game more successful because the defense will not be able to stack the box. They establish a balanced offense and the defense causes a few turnovers that are cashed into touchdowns. I thought Wyoming played a respectable game, especially considering how our games have turned out against Boise in the past. Coffman getting hurt was demoralizing, not just for that game but for the Cowboys season going forward. I think the Cowboys have shown improvement in every game and the defense is starting to get some confidence, but obviously we aren’t ready to play with Boise yet. I will take Brian Hill. He needs to have a huge game in order for Wyoming to compete tonight. Without Coffman and Gentry, Hill is going to be the focal point even more than usual. Nick Smith is an honorable mention, he has yet to really show he can throw the football at this level and he will need to play well tonight to give us a chance. The defense causes 3+ turnovers and turns one of those into points. Our defense isn’t very opportunistic, so this isn’t a likely scenario. The fact of the matter is that Utah State is a heavy favorite for a reason. Because they’re supposed to sugar coat? That’s not their job.